Adam Lyth doubled-up his Day Three century on Thursday before Surrey finished strongly on the final day at The Oval. Lyth was finally out for 202, whilst nightwatchman Steven Patterson made 51 before Dominic Sibley hit an unbeaten half-century of his own as the captains shook hands on a frustrating draw for both sides. Yorkshire made a solid, if unspectacular, start to Day Four as they added 38 from the first 12 overs of the final day, after just 49 overs were available in the first two days due to rain. 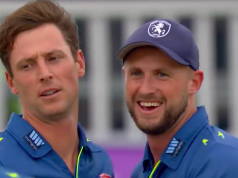 Lyth went through to 150, whereas Patterson reached his third first-class half-century – not a bad No.11 in Yorkshire’s ranks to say the least. A common theme of what play was available was batsmen reaching fifty before getting out, as shown with Aaron Finch, Steven Davies and Andrew Gale. 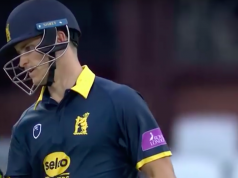 There was to be another name to add to that list when Patterson looked to get on with things and hoick Zafar Ansari over long-on, but miscued and was bowled for 51 from 89 balls. That broke the 91-run partnership, but Yorkshire went on the attack as Lyth and Adil Rashid added 36 in eight overs before Rashid top-edged a pull shot to Finch to give Ansari his second wicket. Spin was coming to the forefront as Gareth Batty was next to strike when Tim Bresnan was given out lbw sweeping for three -enter Liam Plunkett. He batted in typical Plunkett fashion, smashing 37 from 20 balls including two sixes before he was run out after sharing a stand of 58 in seven overs with Lyth. Lyth carried on where Plunkett left off as he guided a six over third man off Stuart Meaker to go to his double hundred, but the bowler was to get his revenge with the very next ball. Lyth skied the seamer to Davies behind the stumps to depart for a magnificent 202 from 291 deliveries to leave Yorkshire 400-8. Surrey wasted no time in wrapping up their last two wickets – Tom Curran dismissed Andy Hodd and Meaker saw David Willey caught for two to finish with 3-66. Yorkshire were all out for 407 giving them a lead of 140. With a draw inevitable, Sibley cashed in on some valuable time in the middle as he and Rory Burns set about making inroads to Yorkshire’s lead. Burns lasted just eight overs before he was caught and bowled by Azeem Rafiq with the score on 20. Yorkshire opted to experiment as Andrew Gale donned the gloves while Andy Hodd bowled leg spin as Surrey’s second wicket partnership passed 50. Sibley went to his fifty before Gale and Gareth Batty shook hands on a draw with what was a close game brewing, Ansari unbeaten on 24, Surrey taking home ten points and Yorkshire 13.